NewsPoet: Kevin Young Writes The Day In Verse Each month, NPR's All Things Considered invites a poet into the newsroom to see how the show comes together and to write an original poem about the news. This month our NewsPoet is Kevin Young. Want to write your own poem about the day's news? You can put them in the comments below. Poet Kevin Young visits NPR headquarters in Washington, D.C., on Friday as a NewsPoet guest. Today at All Things Considered we continue a project we're calling NewsPoet. Each month we bring in a poet to spend time in the newsroom — and at the end of the day, to compose a poem reflecting on the day's stories. Tracy K. Smith kicked off the series, and last month Craig Morgan Teicher joined us in the studio. Today poet Kevin Young brought us the news in verse. Young is the Atticus Haygood professor of creative writing and English at Emory University in Atlanta. His latest book is called The Grey Album: On The Blackness of Blackness. He is also the author of Ardency: A Chronicle of the Amistad Rebels. 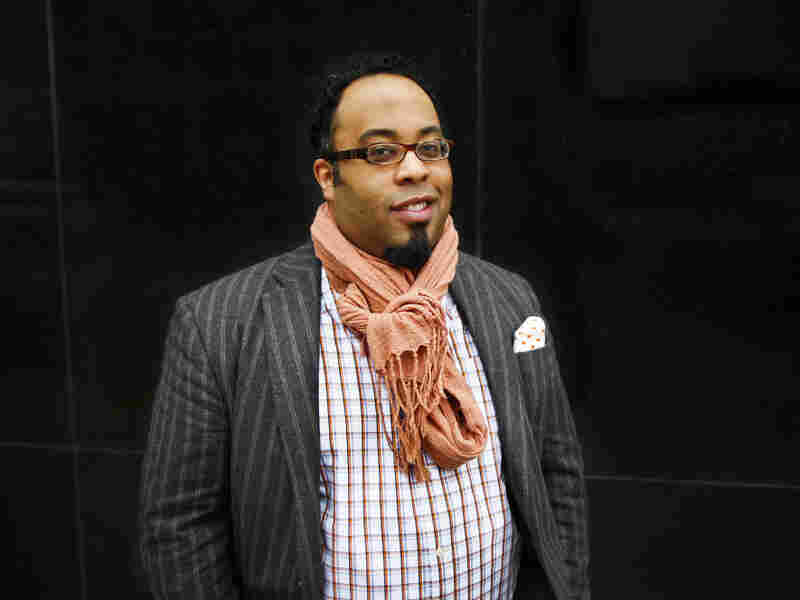 Kevin Young sat down with Audie Cornish, who noted that he might just be the perfect person for this assignment: In his latest book he calls himself "a poet and a collector and now a curator." It certainly helped him jump into the rhythm of the day at All Things Considered. Cornish said that Young took careful notes at the morning meeting, while the staff pitched ideas. "People seemed very calm about it," said Young, even though they had "a spy in their midst." But Young couldn't rely only on his background — he had to get familiar with the day's news as well. He explained that one segment in particular caught his eye. It was an unusual story that imagined what might happen if Texas seceded from the U.S.
"I had spent last May in Texas, living there and writing," Young said. He built on the story's theme and began to imagine the challenges of creating a new currency and a new anthem. Later he combined it with a different news story — this one detailing the demise of the Canadian penny. "Somehow trade relations with Canada seemed to play in," Young said. When asked about the words he used in the poem, Young said he had been thinking about the idea of "cleave." "It's a self-antonym — a word that [also] means its opposite." It's a concept that is featured in his latest book, and the idea of Texas splitting fit right in. Young also says the poem is about loss. "The death of the penny became the death of other things, and a way of mourning something perhaps more grand."